But, as Mark Reynolds admitted, there is no other way of looking upon tonight’s top-of-the-table clash in the Highlands. Anything other than a victory for the Tangerines will leave them needing a collapse from Ross County to beat their rivals to the Championship title. This is United’s last chance to land a direct blow – and they have to take it. Win, and they will happily let the ‘big game’ talk continue. “Every game is huge and if we keep winning they’ll get bigger and bigger,” said Reynolds. “Psychologically it will be massive if we can get closer, and they only have one game in hand left. “If we lose, they’ll be able to afford a couple of stumbles and still fall over the line. The former Aberdeen man does not believe that County’s narrow triumph against Inverness Caley Thistle in midweek automatically means that they have recovered their composure after losing to the bottom team in the division. “I didn’t watch the game but I saw the result coming in and obviously it was disappointing from our point of view,” he said. “They lost points at Alloa on Saturday, though. “And as we keep saying, this league is so competitive and teams will lose points when they’re not expected to. “All we can do it beat the teams who are put in front of us. “We can’t rely on them slipping up too much, which is why this weekend is a good opportunity because it’s in our hands to take points off them. Reynolds added: “We’re confident that we can beat any team in this league. “We can’t afford to give away cheap goals and it might be the case that a set-piece will decide the game again. “Hopefully we’ve got the players who can make the difference. “We’ve done well in a lot of the big games since I’ve been here, and got the win when we’ve really needed it. “The pressure will be huge but sometimes it can be easier to play football against the better teams who want to come out and attack. “It’s two big teams, top of the league. It should be an exciting one. A promotion push is new to Reynolds but coping with the burden of expectation certainly isn’t. “Pressure is pressure,” he said. “It’s as big as you want to make it. 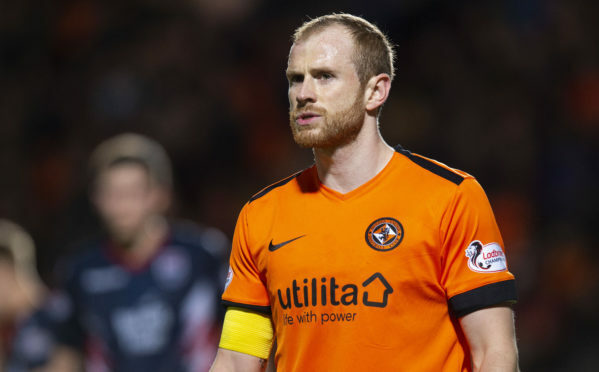 “Dundee United are a club which belongs in the Premiership and there is pressure to get them back up. “At Aberdeen we were competing under the pressure of trying to win a league, win a cup or qualify for Europe. “If you’re at a big club the pressure is always there. Osman Sow is unlikely to feature but Mark Connolly could be in the United squad.